Willkommen! 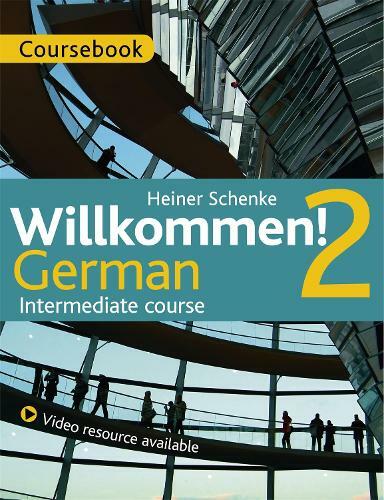 2 Intermediate course is a brand new multimedia German adult learning programme for classroom and home use. This listing is for the Course Pack which includes the coursebook and CD and DVD set. The activity book is available separately (see below for details). Created in consultation with teachers and learners, it's the perfect follow-up to the Willkommen! Beginner's course or any beginner German course. It can also be used as a starting point for study to review and build on existing knowledge. This series comprises 10 units, each with a short educational video that provides an engaging and current overview of German culture and language. Shot on location in Frankfurt, the videos are closely related in topic to each unit in the book, and feature carefully curated interviews (a Green Party councilor with Turkish heritage; two generations of a family running a marble quarry and furniture business; a class of foreign-language students and their teacher; a local couple who hosts travelers from all over the world; an advertising executive who works on the 'Made in Germany' brand for clients such as Lufthansa). Frankfurt's beautiful riverside and historic centre provide the backdrop to the videos. You will visit the GoetheHaus, tour the university campus and sample the delights of the local market. Through the videos, you will be able to enter family homes, cafes and offices, to get a sense of how Germans live and speak today. -Full-colour 190-page Coursebook - the primary text for the course. -CD and DVD set - containing all the conversations and listening activities from the Coursebook plus video content, building on the real-life German used in the course. The course is full of learning features to help you progress in reading, writing, listening and speaking German. It's designed for classroom use but is also suitable for home study. Activity Book (ISBN 9781444165203): for extra practice and review linked to the coursebook units.